Located perfectly been the Asok and Phrom Phong BTS stations, Sukhumvit Soi 20 is truly a wonderland of culinary delights, showcasing mouthwatering cuisine from all around the world. Locals refer to Bangkok as "The City Of Angels" and this heavenly street illustrates why perfectly and also explains why Bangkok is an up and coming foodie destination. Sukhumvit Soi 20 is the heart of Bangkok's entertainment and shopping district and easily accessible by the BTS, Bangkok's Skytrain system. The area between Phrom Phong and Asok BTS stations is notoriously posh and notable for its excellent shopping at both the high-end Phrom Phong Emporium and Asok's eclectic Terminal 21. After a long day of shopping, seeing temples or wandering the fascinating streets of the Thai capital, you will be hungry. Fortunately, Soi 20 is full of options for any type of cuisine that you could want. We detail eight excellent options below. All of these fabulous restaurants are just a few minutes walk from either the Phrom Phong or Asok BTS stations. The Koi franchise started in cosmopolitan Los Angeles and soon spread to Las Vegas, New York, and Bangkok. You would be hard-pressed to find fresher sashimi or sushi anywhere on the planet. Koi Lounge Bangkok specializes in traditional Japanese cuisine as well as exciting fusion options that will delight and surprise you. Open Tuesday through Sunday from 6 pm to 1 am and Friday and Saturday from 6 pm to 2 am, Koi Lounge Bangkok is also a nightlife hotspot. Check out their exciting menu and wash down your sushi or sashimi with a signature cocktail from their inspired bar menu. If pizza is what you crave you do not need to visit Venice to get it. Basilico Pizzeria brings a taste of Italy to the streets of Bangkok and specialises in serving homemade, fresh and authentic Italian food. Get your fill of pizza or traditional Italian pasta made with love. If you have a sweet tooth you should not miss their tiramisu. It's creamy, light and accented with coffee and chocolate flavors for an unparalleled experience. You can also compliment your lunch, dinner or dessert with a great glass of wine. Open daily from 11 am to 2:30 pm and 5 pm to 11 pm, Basilico Pizzeria is a great choice for lunch, dinner, or to grab a quick snack after a night checking out Bangkok's extraordinary nightlife. Chesa Swiss Restaurant is one of Bangkok's premier places to dine for the past thirteen years. They are open from 11 am until 11 pm every day, so you can pop in and enjoy some traditional Swiss and European food at any time of the day. They specialise in catering to long, leisurely dining experiences with an emphasis on great food and fellowship. With an extensive wine list and a comprehensive menu that features all of your favourite European foods, Chesa Swiss Restaurant is a little bit of home away from home. Do not miss their hearty traditional soups, several different kinds of cheesy, delicious fondue and favourites like Osso Bucco and Pork Cordonbleu, made just like your grandma used to cook! Spain pioneered the idea of tapas and it has since caught on like wildfire throughout the world. Tapas are incredible because you can try a number of different flavors with small dishes and still have room for dessert or another glass of wine. The owner of Taberna Jamon Jamon is originally from Madrid so the flavors are totally authentic and many of the ingredients are actually made from scratch right in the restaurant. There are traditional Spanish dishes like Iberico ham and homemade chorizo as well as fresh calamari and prawns. Taberna Jamon Jamon also has an extensive wine list so you can sip and sample your way around Spain right in the heart of Bangkok. They are open from 9 am to 11 pm every day and you can even celebrate Spanish style on Friday nights with their weekly Flamenco dancing night and sangria specials. Bangkok is a city that is friendly to vegetarians and Saras is a great example of the veggie-heavy food culture of the City Of Angels. They specialise in vegetarian food with a decidedly Indian slant and celebrate the food of the Indian subcontinent by creating traditional and serving traditional dishes the way they are supposed to be made. Saras pays a lot of attention to really getting the recipe as right as possible, so you are not likely to have more authentic Indian food anywhere else outside of India. Their menu is split up by region and features local favourites like Cheese Masala Dosa and Paneer Tikka. If you want a multi-layered flavor experience without the meat, Saras is one place you really need to check out. They are open from 9:30 am until 10:30 pm every day. If you are visiting Southeast Asia, you really need to try Korean BBQ. Fortunately, you don't need to fly to the Korean peninsula to try some sumptuous BBQ. Injin “Lauren” Kim brings the best flavors of Korea to Thailand and mixes them up a little with inspired fusion dishes like spaghetti with Korean-style beef. If you are craving something a little more traditional, nobody does the favourites better than Banjoo BBQ. They import their meat from Australia and serve up thick cuts of steak so they're full of flavor and extra juicy. If you want to enjoy a glass of wine with your Korean BBQ, there is a 500 baht corkage fee and Banjoo BBQ is open every day from 12 noon to 11 pm. Nobody does comfort food better than Germany and if you're craving stick-to-your-ribs favorites like authentic sausages or potato pancakes, but Bei Otto on your "must dine at" list. They have a bakery on site so you can stock up on the best European loaves of bread and baked goods, or simply sit down for a hearty platter of peasant food, German style. There are plenty of German beers on tap also, so you can wash down your wurst with some Hefeweizen. If you are visiting with friends, an economical option would be to split one of Bei Otto's famous beer towers, which they fill to the brim with imported lagers or ales. Why not order a few dishes and split them Bei Otto is open every day from 6 pm to 11 pm and their pub is serving beer until midnight. Siam Soul Cafe is the last work in excellent Thai food. If you are visiting Bangkok, you really need to sample some of the best cuisine that the city has to offer. Thai cuisine is unlike any in the entire world because it celebrates a whole spectrum of flavors; sweet, bitter, sour and salty. The end result is dishes that are loaded with layers of flavor and unexpected combinations. Siam Soul Cafe is perfectly appointed with sophisticated Thai decorations and serves up some of the country's best-known dishes like mouthwatering Pad Thai, fiery Som Tum (Papaya Salad) and creamy mango with coconut milk infused sticky rice. Open 6 pm to 10:30 pm, this local hot spot is not to be missed if you want to truly experience the best Thailand has to offer. 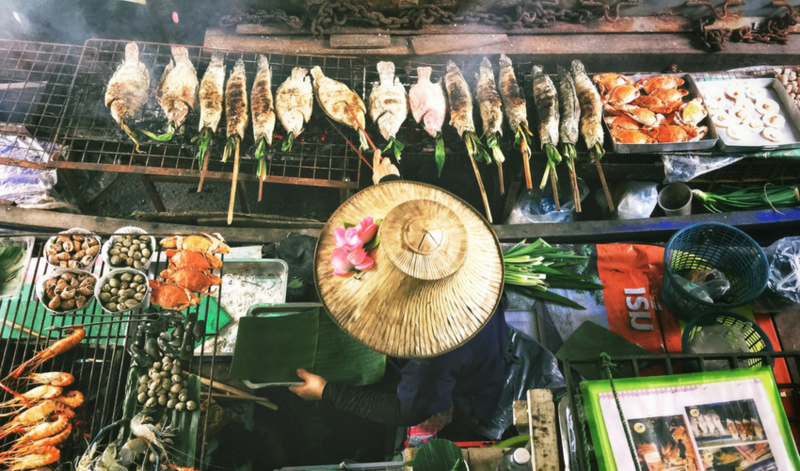 Countless celebrity chefs and food bloggers have recognised Bangkok as being in a class all of its own when it comes to a thriving culinary culture. From the abundance of fresh fruit vendors selling exotic treats like chilled pineapple and dragonfruit, to street food favourites like crispy fried chicken and spicy noodle soup, you will definitely not go hungry in the City Of Angels. Along with the spectacular temples, deep history and ample shopping experiences both in large outdoor markets and state-of-the-art shopping facilities, food is one of the things that is really putting Bangok on the map and making it one of the most sought after cities to visit in all of the world. If you want to elevate your already incredible culinary experience you really must visit Sukhumvit Soi 20 and see what the locals have long known and expats and visitors in the know are learning rapidly; that this soi is the epicentre of Bangkok's food culture. From the freshest Japanese seafood to tiny plates of Spanish tapas, there is something for everyone on Sukhumvit 20. If you are looking for the best Thai food in all of Bangkok, this is the place to go to savour authentic plates in Bangkok.